This morning I made EJ one of his favorite breakfasts of scrambled eggs (with some of my garden herbs), homemade toast, a banana, and coffee. Afterwards, I prepared two homemade chicken pot pies. It is my favorite meal–and EJ and JJ love it too. By the end of the day, we had only one pie left. After I put the pies in the oven, EJ and I went out to the garage and got out the insulated cat house he made last year for the outside cats. We carried the house to the front porch and put a tarp over it and the patio table–to protect both the house and the table from the winter weather. It’s not yet cold or wintry, but it is getting cooler outside and now the cats will be cozy. When we finished, the pies were baked so EJ and I ate lunch. (JJ didn’t go to bed until 8 a.m. and didn’t wake until 5 p.m. His sleep cycle is messed up again.) After we ate, I walked to the post office to get our mail and also buy some stamps from the friendly Postmaster. The temperature was crisp today, but the sun felt warm so it was a very nice to walk. I sorted through our mail as I walked home, and I felt a surge of dismay and anxiety when I saw the jury summons. 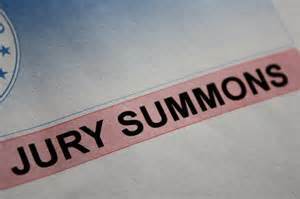 You have to understand: Over the years, I have received numerous Jury Summons in the mail. Now, I understand that serving on a jury is a privilege and a right and a responsibility, and I think that it could maybe be interesting. However, Jury Summons always seem to come at very inconvenient times in my life. For example, the first time I received a summons, I was working, going to college, and it was during finals week. So not a good time. I wrote a letter and got a postponement, but I had to go in a few months later. I went through Jury Selection but was not chosen. (For those who are not familiar with the Jury Selection process, you can read about it here: Michigan Jury Selection.) The next time I was summoned for Jury Duty, the court case was scheduled to begin on Monday–two days after my wedding. I went to Jury Selection a couple of days before my wedding, preparing to throw myself on the mercy of the Court….but fortunately the jurors were selected before getting to me. Then I was summoned when JJ was a toddler and I had no babysitter. I went to the Jury Selection, but fortunately I was not selected. Then I was summoned during a time when I suffered a lot of health problems. The doctor wrote a note and I was excused. I have never had to actually serve as a juror, but you can see that I have been called numerous times. Whenever I get summoned, I have to drive to a courthouse in the middle of a city that I am not very familiar with. This is a problem because I have a terrible sense of direction and I get lost super easy. So beginning the week before I have to go to the courthouse for the Jury Selection, EJ makes me drive the route several times with him in the car in order to help me become familiar with the route so that maybe I won’t get lost. Added to this is the fact that I am an Empath who feels the suffering of others to the extent that going to hospitals is an ordeal and I can’t watch violent movies. So having to sit in a courtroom and listen to gory details of a murder case is a problem. Not every case is a murder case, of course, but with my luck it would be the most gruesomest murder case ever. I can imagine (with horror) fainting in the jury box or even vomiting. I wonder if a mistrial would be called if one of the jurors (me) couldn’t endure hearing the details of the case? Meanwhile, EJ has never, never, never, received a Jury Summons. Not even one. Not in all his life. He thinks it would be interesting to sit in on a case. He doesn’t get lost. He doesn’t faint in hospitals or anything. Not me! Not me! Not me! Not me! Not me! YOU! I’m trying not to gloat too much because, with my luck, if I gloat I will get a summons in the mail tomorrow. EJ sat down immediately and filled out the jury form and set it in the basket to be mailed. After he went to work, I joyfully walked Danny, washed out some milk crates that we found in the garage, did some light housework, chatted with a dear friend, and made homemade bread. I was called up once, got my name drawn, answered questions of the lawyers then was excused. I believe it was because the man on trial was my husband’s cousin. Not sure which one knocked me out. May have been the defense. Everyone in the family thought he needed jail time for selling drugs. Yea, being related to the defendant would excuse you, for sure. I have never actually made it to the point at which I was questioned by the lawyers. I had to take a Business Law class in college. Part of the class included watching 2 hours of any part of a case. A classmate and I went together and randomly chose entered a courtroom to watch a case. It was the opening arguments of a malpractice suit. It was interesting. Although I’m glad I didn’t have to listen to the medical details much. I think being a juror would be interesting except for the inconvenience, the worries about getting lost, transportation problems (right now we are down to just one vehicle, which would make it difficult for EJ to get to work), and the potential difficulties of gory details. Hope it all works out as you need it to.